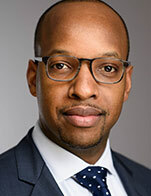 Christopher Baxter is a Vice President on the Exchange-Traded Fund (ETF) and Closed-End Fund (CEF) Research team at Morgan Stanley. The team is responsible for rating approximately 100 CEFs and providing research on the ETF industry. Christopher began his career in financial services at the Royal Bank of Scotland in Structured Product Sales focusing primarily on Exchange Traded Notes. Christopher holds an undergraduate degree in natural resources and sociology from Cornell University and earned a Master's degree in City Planning from the University of Pennsylvania.